We have interviewed New York University Professor Paul Romer, who has started the so-called mathiness debate, where he criticizes certain economists for using math for obscuring facts. Specifically, we asked him about his intentions. 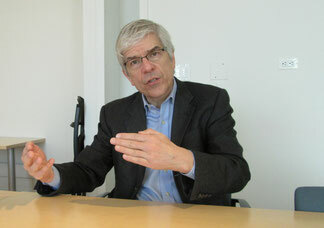 Paul Romer, 60, was born in Colorado, the United States. He received his bachelor’s degree in physics at the University of Chicago, and earned a Ph.D. in economics at the University of Chicago Booth School of Business. He taught at his alma mater, as well as Stanford University, among other institutions. He joined Leonard N. Stern School of Business of New York University as professor of economics in September 2011. He is known for developing the endogenous growth theory, which holds that economic growth will continue even after capital productivity decreases due to renewed technological innovation. Q: Why did you criticize “mathiness”? A: Economists have started using mathematics in ways that are inappropriate – instead of clarifying, it has tended to obscure the analysis. It is used to persuade people of a particular position, rather than facilitate scientific exchange over the facts about what’s true. But this is not a critique that economists are using too much math. It was a challenge to a particular branch of modern macroeconomics which is associated with the University of Chicago that has become a strong force. Q: You have criticized Professor Robert Lucas of that particular branch, who is a Nobel Economics Prize laureate. A: Professor Lucas is the most admired and most senior figure in that school. And he was also my thesis advisor. There was a particular paper of his on growth – it was written with a co-author (in 2014) – but I thought it was particularly a bad case of this kind of mathiness. So I think the thing to do when you see things not working is to shine a light, so to speak. Q: What is your view of the Dynamic Stochastic General Equilibrium (DSGE) model, which in part is associated with the Chicago school? A: I think the DSGE model was a kind of papering over the total failure of the Real Business Cycle (RBC) model (which posits that business cycle fluctuations are induced only by real variables such as production technology and fiscal policy). The RBC model was scientifically untenable, and the DSGE model doesn’t go far enough in the direction of understanding the real sources of business cycle fluctuations. Q: You mean that it has lost touch with the reality? A: The RBC model has no empirical validity. So the DSGE model tries to bring in a tiny bit of empirical relevance, but it doesn’t address the big questions of what causes recessions and how can policies help us recover from those. It’s one that Keynes has suggested with the story with the beauty contest, where you are trying to forecast what other judges will think is the winner of the contest. If I think everyone else thinks it will be this person, then I will vote for that person. But if I think, “Oh, no, everybody else will think it will be this other person,” it will change the outcome. So there is a basic indeterminacy or open-endedness about expectations, which Keynes highlighted. It’s an idea we have to take seriously in economics. I think the idea that we need to bring back to macroeconomic theory is this possibility that what people expect about the future can determine what happens. Q: How and when have certain economic theories started to deviate from scientific and evidence-based approaches? A: You can date the transition between 1972 and 1982. In 1972, Professor Lucas published a paper entitled “Expectations and the Neutrality of Money” (on the rational expectations model). Macroeconomists were still trying to understand how monetary policy in central banks could interact with the real economy. And 1982 represents a kind of a watershed where we had the publication of this paper by Professor Edward Prescott and Professor Finn Kydland about the first RBC model. Professor Prescott was saying that monetary economics is completely irrelevant, and that it doesn’t have anything to do with what’s going on in the business cycle. Evidence has clearly demonstrated that this is an absurdly mistaken view. But what’s happened is that many of the disciples of Prescott are trying to make excuses for a model that has no empirical plausibility. I think it’s a disturbing picture that people who are so wrong can remain so influential for so long. It’s a sign that something has gone wrong in economics as a science. Q: What does the field of economics need in order to become a true science? A: One of the most telling signs of the failure of science is when a group of people become excessively deferential to authority, and there’s authority who sets the path for everyone. It’s just like a religion where there is someone who presents a dogma, and everyone follows along. A sign of healthy science, on the other hand, is when anyone can say, “Well, Professor Lucas says this or Professor Romer says this. But I don’t think that’s right, and I think here’s what’s right. Let’s look at the evidence and see.” Good science is always democratic in that sense, and it is not authoritarian. It has become the culture in economics that you would never criticize someone as senior and significant as Professor Lucas. (My mathiness critique) was provocative because this issue is so important to attract attention to. It is a critique of the written work and critique of the (obscuring) style, and it’s not a put-down of the people. Q: Is the answer to mathiness more math, and not less math? A: If you do math in a clear way, in a way that captures the essence of what you are trying to say, and you use the model to discipline your thinking, that’s exactly what we should be doing in macroeconomics. But it will also take a recognition that math can never give you the answer. Ultimately, you have to look at evidence. Math can help you understand the logical connections; it helps you understand some possibilities you didn’t think about. But at the end of the day, the only way to know what’s true is to look at the evidence. 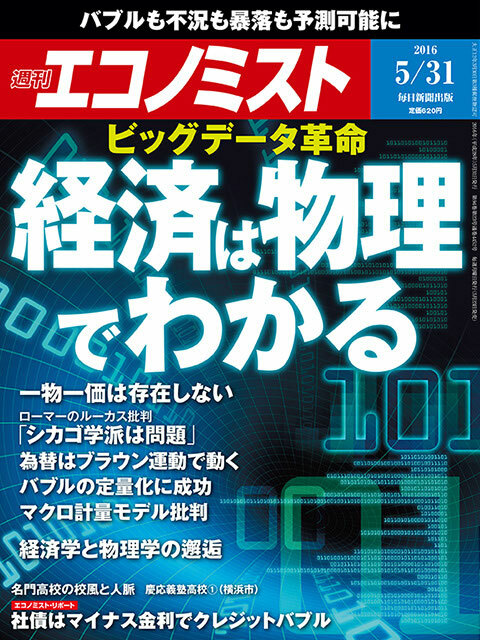 Copyright Mainichi Shimbun Publishing Inc.All rights reserved.